Following military service in World War II, Brady played quarterback and punted at Nevada, where he set an unbreakable record with a 99-yard kick. 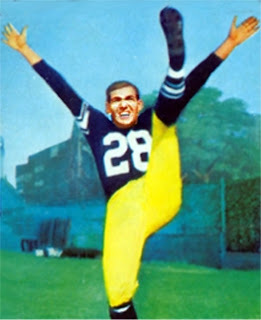 Acclaimed for his long, booming punts, he transferred to Bradley after Nevada briefly dropped football in 1951 (the program was revived the following year). The left-footed Brady was chosen by the New York Giants in the 13th round of the 1952 NFL draft but joined the Hamilton Tiger-Cats of the CFL. Released by the Tiger-Cats, he signed with the Steelers and averaged 43.2 yards on 77 punts. Steelers went 6-6 to finish fourth in the NFL Eastern Conference. Brady followed up by again leading the NFL in punting with a 43.2-yard average in 1954. However, a torn Achilles tendon injury suffered during the 1955 preseason ended his career after just three seasons. Overall, he averaged 44.5 yards on 223 punts. Brady was selected to the Steelers’ 50th anniversary all-time team chosen in 1982. He was also inducted into the Univ. of Nevada Athletic Hall of Fame and was selected to Nevada’s Team of the Century in 1998.